Rapid Fire Ministries is one of the most innovative & grounded ministries of today. The innovative platform and delivery of the gospel message reaches beyond the walls of the church and into the youth culture as a whole. Each performance is grounded deeply in the Gospel (Good News) message of the love of God through Jesus Christ. Rocky “T-Rock” Thomas is a Youth Pastor and founder of Rapid Fire Ministries. He employs his Christian Rap along with his talents as a 3rd degree Black Belt in Taekwondo to bring a cutting edge, high energy ministry aimed at the hip-hop generation. Mandy has the attention of the masses with her beautiful voice delivering the SOLID ROCK message of the Cross and our Savior. Southern Gospel and Contemporary Christian music are just a part of what this beautiful lady brings to the performance. Rocky and Mandy's oldest son Blaze (13 yrs old) hit the scene at age 4 and continues to bring the message with youth and liveliness. As an aspiring drummer, singer, and developing rapper, he delivers the hard hitting message of Jesus Christ with the seasoned determination of a veteran using his talents to glorify God! Rapid Fire Ministries implements a combination of singing, martial arts, drama, hip-hop dance, rap, and preaching in presenting the Gospel message across the nation. T-Rock and Mandy's ministry brings a balance of family, sincerity and energy that touches all ages while engaging today's generation. Available for your church, school, festival or other events, T-Rock and Mandy look forward to working with you to share the Gospel of Jesus Christ in your community. They have seen over 5,000 salvations during their ministry! 2010 recipient of Holy Hip Hop Award for Excellence in Ministry. Rapid Fire and Flud Cavion's song "Battlezone" is included in the Holy Hip Hop Compilation: “Taking The Gospel To The Streets: Vol. 5” and “Keep The Word” and “One Of The Nine” are featured on Holy Hop Hop Compilation: Vol 15 and both cd’s are distributed worldwide by EMI Gospel. Opened for Contemporary Christian artist Jaci Velasquez, Code of Ethics, Bleach, Supertones, Audio Adrenaline and Reality Check. Rocky currently is writing theme songs for different ministries as well as for the Arkansas Razorbacks (Football, Basketball, and Baseball) as well, as for other groups, schools and organizations. "Christmas Time" written by Rapid Fire and performed by Jim Murphy of Mission House Music and Rocky Thomas of Rapid Fire is in rotation at radio stations all over the country. See www.jimmurphyonline.com for more details. Rocky has written children’s books and has an Audio Bible of Galatians and Ephesians set to Hip Hop. 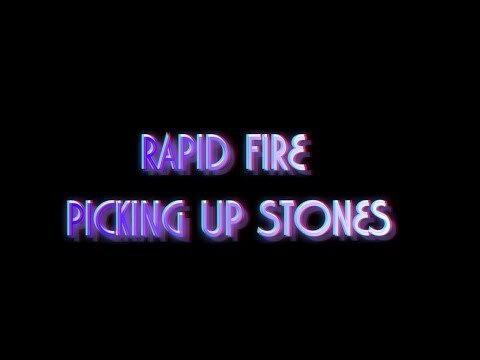 Picking Up Stones by Rapid Fire.